Royal Wedding Guests Are Selling Their Favor Bags! Is This Kind of Rude, Or Is It Just Us? In case you’ve been living under a rock, there was a teeny tiny Royal wedding over the weekend when Prince Harry married former American Suits actress Meghan Markle. We kid! The wedding was not only watched by millions across the globe, but it ruled social media all weekend long. Not only was the ceremony at St. George’s Chapel at Windsor Castle downright beautiful, but there was also a super lit sermon by Bishop Michael Curry, a musical selection from the Kingdom Choir that sounded like their vocal chords were lubricated by Jesus himself, and let’s not forget, the sight of Oprah’s good church hat. Those who were lucky enough to attend the nuptials across the pond—or at least obliged the new Duke and Duchess of Sussex’s invitation for 1,200 members of the public to gather outside of the chapel to witness the ceremony—walked away with a commemorative gift bag that was full of royal-themed goodies to mark the big day. But some of those lucky guests have done the unthinkable and are now trying to hawk the items on eBay with major markups. 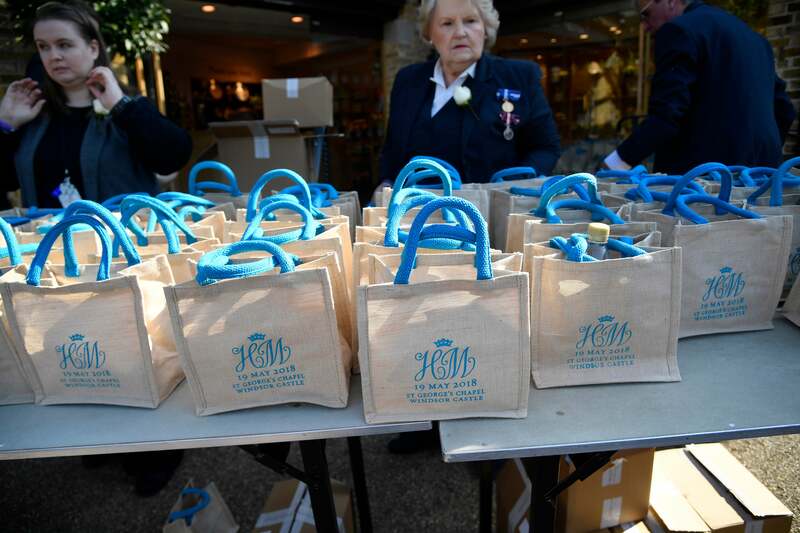 According to PEOPLE, inside each goodie bag contained a gold wrapped chocolate coin, a water bottle, shortbread, a magnet featuring the wedding date and the initials of the bride and groom as well as a spectator badge letter and wristband. As of Tuesday morning, the bidding on eBay was up to 21,400.00 GBP, which is a whopping $28,689.91. Now, is it just us, or is this rude and tacky wedding guest behavior? We get it, the world kind of stopped when Meghan emerged walking down the aisle with Prince Charles by her side. When Prince Harry lifted her veil and adjusted it behind her royal tiara, the world smiled. As the mother of the bride, Doria Ragland, sat alone wiping tears from her face as her daughter was welcomed into the Royal family, and viewers instantly embraced her poise. Fans would’ve given anything to have been there in person, yet these guests decided to snuff at the good-hearted invitation of the new Duke and Duchess of Susses by turning their keepsake gift bags into quick cash. Now that’s anything but classy behavior. What say you? Did the public Royal wedding patrons cross the line by selling their favor gift bags or is it ok in your book?